My first encounter with ghosts was at the Avery House, one of Ft. Collins’ earliest and loveliest homes turned event venue and arts council office where I volunteered once a week. I’d heard a vague rumor about the Avery family ghosts but wasn’t expecting to run into them on the second floor when I was alone in the house one day. I can’t say that I saw them, only that I felt their sad presence, more sorrowful than malevolent. I wasn’t frightened but I slipped quietly back down the stairway anyway, thinking it best to leave them alone in their grief. My second ghostly encounter was in a Queen Anne-era bed and breakfast in Denver when I woke one night to an angry spirit hovering near the four-poster bed. Although the light, or aura, I suppose it’s called, of the ghost was bright red, somehow I knew it wasn’t there to scare me and I went easily back to sleep. Since I hadn’t felt threatened and no one had ever claimed a ghost in that house before, I didn’t mention it when I checked out the next morning. If a ghost isn’t bothering me in particular, I guess I’m willing to leave it alone. These experiences seem to make me less a sceptic than Hannah Nordhaus in her recent book, American Ghost: A Family’s Haunted Past in the Desert Southwest. But perhaps it’s easier to believe in a former resident haunting an historic home when the ghost isn’t one’s own great-great-grandmother. As with the best of genealogical narratives, American Ghost by award-winning journalist and historian Hannah Nordhaus is really two stories: the story being investigated and the story of the investigation itself. In American Ghost, Nordhaus researches the life of her great-great-grandmother Julia Stabb, who followed her husband Abraham to Santa Fe after their 1865 marriage in Germany. The elegant home Abraham built for Julia is today known as La Posada, a hotel believed to be haunted by Julia’s ghost. Using family diaries, historical biographies, and government and church records, Nordhaus reveals how Julia’s life was intertwined with the early days of Santa Fe’s settlement, from city planning to religion to commerce, for the Stabbs were a leading family in Santa Fe’s history, helping establish its development from a Western outpost to an important cultural and commercial center. However, it’s not just Julia’s life that stands at the center of Nordhaus’ book: Julia’s death and its probable cause take Nordhaus into the realm of psychics, 19th-century “women’s cures” and charlatans, and a family history of mental illness and suicide. This second story in American Ghost of Nordaus’s efforts to find the truth of Julia’s life and death is just as interesting as the first. Here we follow Nordhaus to some seemingly seedy places as she consults those who claim the ability to commune with Julia’s ghost. We follow Nordhaus, too, as she travels with her mother to visit her family’s burial ground in the Jewish cemetery in Lugde, Germany, and to Theresienstadt, the infamous Nazi propaganda death camp where some of Nordaus’s relatives perished. Even though these events happened after Julia’s death, the weight of Nordhaus’s family history draws us further into Julia’s sorrow. In American Ghost, Nordhaus does provide her great-great-grandmother Julia a voice through uncovering her story, but will gaining a voice quiet Julia’s troubled spirit and set her free from haunting the La Posada hotel? That’s a question beyond Nordhaus’s book, but one connoisseurs of ghost stories should consider. In the end, don’t we want some mystery to remain, some trace of the ghostly presence to linger? After all, we may run into one ourselves someday, leaving us with our own ghost story to tell. I had that dream again last night, the one where I suddenly discover a room in my house that I had forgotten or hadn’t realized was there. The first time I had this dream was the night after I turned in my dissertation: I opened a door in my hallway that I’d never noticed before and inside found everything I’d had to put metaphorically in storage while I finished my Ph.D. Lately these dreams are less about reunion than about finding more space in my life for things that are important, like creative endeavors or spending more time in contemplation than in motion. The essential feature of all these dreams, though, is that these rooms are already in my house, just waiting for me, like Dorothy finding she’s always had the power to go home. I’ve always been pulled to the idea of home, of inhabiting a place where I feel rooted. Home for me is both inside and outside a physical structure; without a garden around it, a house wouldn’t feel like a home. So they had reason to feel that my social graces were eroding away, and that soon I would feel ill at ease in a cleanly house with glass in its windows—I would be lost to ordinary society. In Home, published 28 years later, a middle-aged brother and sister return home to care for their ailing father, a former minister in a small Iowa town, amidst the background of the civil rights movement that the son defends and the father resents. Younger sister Glory is escaping a failed love affair; her older brother Jack, their father’s favorite, is returning 20 years after the disgrace that drove him away. The old prairie came back the minute a spot of ground fell into neglect. Suddenly there would be weeds head high, gaunt shafts of plants with masses of tiny flowers on them, dusty lavender, droning with bees. And there would be black-eyed Susan, and nettles and milkweed and jewelweed and brambles and some avid vine that wilted in sunlight and broke at the slightest touch, leaving tiny whiskers of thorn in the hand that touched it. The roots they put down were deep and tough. It was miserable work to get them up. And here was Jack in the new morning light wrestling weeds out of the ground for all the world as if something depended on it. In the 28 years between these novels’ publications, Robinson’s idea of home seems to have shifted from domesticity as prison to home as the continuation of family from one generation to the next. Yet in both works, it’s the outside forces of society that threaten the safety and sanctity of home. When women or people of color or anyone considered “different” don’t or won’t follow the rules for “proper” social behavior, they are denied the possibility of home by the very structures of power that prescribe propriety in the first place. In both novels, the characters must choose between limiting their lives or leaving home. Neither choice is ultimately fulfilling, but both novels end with the fantasy of return, Ruthie to the sister she’s left behind, and Glory to the dream of Jack’s son finding the old house—and his aunt—waiting for him. We dream of home as a piece of ourselves that exists even in our absence or outside our awareness. Home contains us in both the best and worst sense of the word, for from home, we long for release even as we are rescued by it. Home is what we most fear losing but most want changing. Never perfect, always yearning, we keep our home so that we can keep ourselves. Growing up, I was a bit of a horse girl. I was one of those girls who cried over Black Beauty and Misty of Chincoteague. My favorite book in first grade was Brighty of the Grand Canyon, about a sweet little burro, which was close enough to a horse for me. Around fifth grade or so I received The Girl Scout Book of Horse Stories as a gift, stories combining Girl Scout resourcefulness and courage with the wild independence of horses. Like horses, Girl Scouts have a mind of their own. 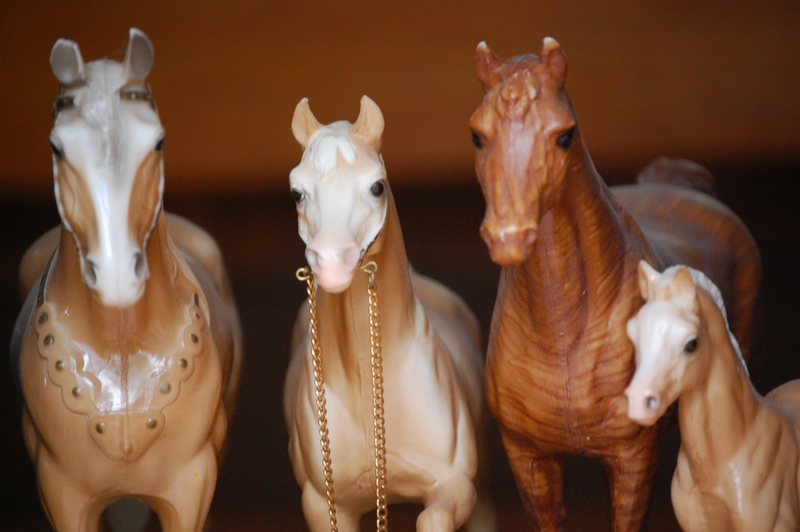 I collected Breyer toy horses too and but I never had as many as my older cousin did. She had a whole cabinet for hers while mine fit on a shelf. I didn’t have any of the showy appaloosas or pintos or paints like hers; instead, my horses were classic breeds, making up in elegance what they lacked in variety: the white Arabians, the golden Palominos, and the dark brown Thoroughbreds. 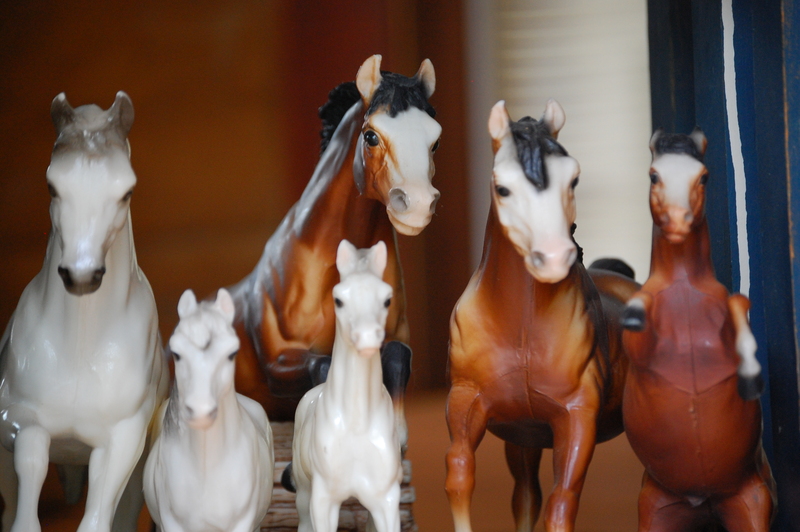 I collected my horses in families of mother, father, and foal, with a cousin pony sometimes keeping them company. I still have those horses. I love the beauty of horses but not so much riding them. They’re alarmingly large to me and unpredictable. I’ve been on a horse a dozen times and always just manage to ride comfortably enough, the horse paying less attention to who’s on their back than to finding dinner back at the stable. I may not be a rider, but I’m always thrilled to come upon a herd of multi-hued horses pasturing in the foothills along my drive to town. And I’m still happy to chance upon a good horse story, like The Hearts of Horses by Molly Gloss, a novel of an unusual young woman, Martha Lessen, who “gentles” horses for a living. Inspired by the oral history of a “rancher’s daughter” whose words introduce the story, the novel is set during WWI in eastern Oregon and the plot device—she travels a circuit of several ranches to train each family’s horses—allows Gloss to examine the rural situations and prejudices of the times. I’m not sure what interested me more—young Martha’s avoidance of gender restrictions with her “man’s trousers” and self-reliant ways or Gloss’s descriptions of the horses Martha handles. Despite her bashfulness, Martha never shies away from doing what’s right, whether it’s rescuing a horse from a foreman’s whip or helping a family in need. I have that feeling myself; even though I’m not yet facing old age, I am trying to figure out at fifty what to do with the next part of my life. As a young girl dreaming of horses, this jumping off feeling was breathless with possibilities of what I might be when I grew up. Now that I’m grown, I’m more cautious about the choices I may make, or more certain of the criteria they must fulfill. Still, at any age, we must choose how far we’ll go without knowing exactly where we’re going. Do we give the horse we’re riding its head or hold the reins even tighter? I’m waiting for the fire to take. May 13th and we’re still lighting the woodstove for heat. We had snow two nights ago and last night dipped to 30. The question is, will the apples freeze tonight if the cloud cover lifts? The cool, moist spring has brought a beautiful show of blossoms but one frigid night will nip them in the bud. Good to know what that old saying really means: if the cold enters the tiny fruit at the center of the blossom, the emerging apple will freeze and blacken. Cold this late in the season means potential devastation for our vulnerable old trees. Until the weather turns, we’re living on the edge. It’s not like our livelihood depends on apples, not like a commercial orchard would, or like growers during the Depression who needed every piece of fruit to survive. Until I read The Orchard by Adele Crockett Robertson, I didn’t realize that apple rustlers of that time would sneak into orchards to steal fruit. In Robertson’s memoir, she writes of trying to save her family’s land in Massachusetts by saving the apple orchard. Robertson was in her early 30s, college-educated and unmarried, when she convinced her doubtful family that she could manage an apple business after her doctor father’s death and Depression-era debt reverses the family’s fortunes. Like farmers today, Kitty, as she was known, faced challenges both human and natural—growing debt, cutthroat competition, broken machinery, insect infestation, and unpredictable weather. She even faced down rustlers with a pistol—unloaded, but they didn’t take the chance of finding out. Robertson paid her small crew of immigrant laborers above-average wages, earning their loyalty and respect when they saw how hard she worked. But was her persistence and courage enough to save the orchard? I won’t give the answer away except to say that it’s sexism, not her own failings, that determine the story’s ending. What’s most remarkable is that Robertson wrote her memoir and then stuck it away at the bottom of a bookcase, never published. Her daughter found it after Robertson’s death and fortunately realized what a treasure it was. Whenever I worry about our apples, I can’t help but think of Kitty Robertson, a daughter of privilege, skin brown from the sun, climbing ladders, peddling apples, and trying her level best to save a piece of land from Depression developers exploiting the misfortunes of a family and a nation.